Romesco Sauce is from the Catalonia region of northeastern Spain and is probably as famous there as ketchup is in other regions of the world. Like Italian pesto, this versatile Spanish sauce is raw, not cooked and is low carb, vegan, keto and paleo friendly. Healthier but just as flavorful as my original version, what is missing from this recipe is the bread which is used as a thickener in the traditional Catalonian version. Made from vivid roasted sweet red bell peppers, almonds and olive oil, it is delicious served with fish, chicken, and grilled meats and vegetables. While usually made with dried nyora chilies, most people living outside of Spain use roasted red bell peppers. You can roast your own which I’ve done in the past but if short on time, use jarred roasted red peppers that have been packed in oil like I did for this recipe. I served this healthy, vivid roasted red bell pepper sauce on a chicken breast and the simple dish had me reminiscing about our trip to Spain last fall. While in Barcelona, we saw Romesco sauce served alongside several different tapas dishes. Place the almonds in a food processor and pulse until chopped fine. Be careful not to process too much or you will end up with a paste. Add the garlic, peppers, vinegar, salt, pepper and cayenne to the food processor and pulse until a smooth consistency. Slowly drizzle in the oil while the processor is running. You should end up with a slightly thickened, creamy consistency. Taste and season with additional salt, pepper and cayenne, if necessary. If the Romesco sauce is too thick, drizzle in a little more oil while processing. If too thin, add a little more finely chopped almonds. The sauce can be refrigerated for up to 5 days. 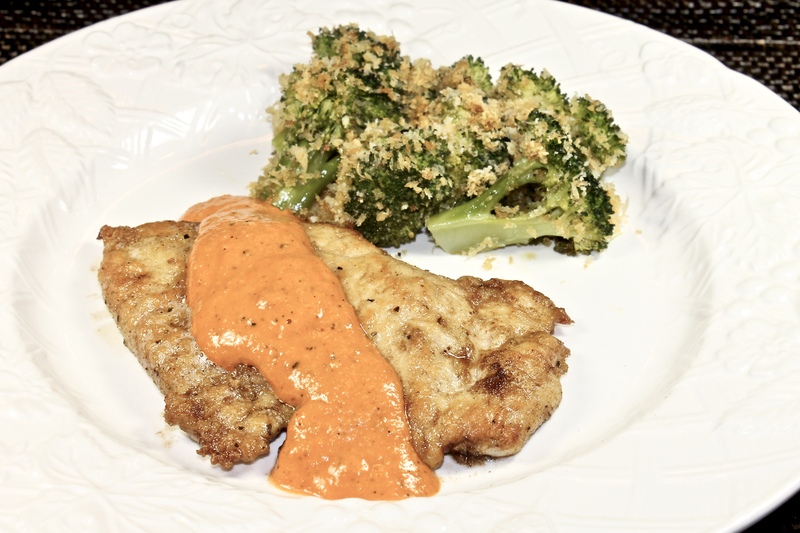 The romesco sauce added vibrant color and wonderful flavors to the simply prepared chicken breast that I served it with. While a slightly thinner sauce than the traditional version made with the addition of bread, I don’t think the bread adds much flavor but definitely adds carbs and calories that I was trying to avoid. If you have been making an effort to cut out carbs from your diet, I think this condiment will be a staple in your kitchen. This healthy romesco sauce has so many uses…serve as you would hummus, as a sauce, a salad dressing or even as a flavor enhancer for soups and stews. This entry was posted in Home, lifestyle, photography, recipes and tagged healthy condiment, healthy cooking, keto recipe, low carb recipe, low carb romesco sauce, romesco sauce, Spanish food, vegetarian and vegan. Bookmark the permalink. You’ve definitely got the right colour and the consistency looks good without bread. I believe that romesco was originally an accompaniment to fish, but has since become very popular with calçots and as you rightly say, it is served with many things these days. I’m sure it’s delicious with your chicken! I suspect the bread thickener in many Spanish dishes, is a method for using up stale bread and to bulk up food when times were hard. Yum, this looks delicious! I’ve made Romesco sauce before and it was great as a dip for potato wedges. Your recipe sounds great! Thank you for your compliment Grace. You are right, it would be terrific with potato wedges…much better than ketchup. Lovely! I shared it with all my friends who are doing the Keto diet! I”m sure they will love it! Thank you Kelli, I really appreciate you sharing my recipe with your friends that are doing the Keto diet. I think they will find that they can use the romesco sauce often…it has a wonderful flavor. A great recipe. I will be making it!! Thanks. Thank you Darlene, I hope you will enjoy the romesco sauce as much as we do. Hi Sylvia, It is nice when you can have a recipe that is both healthy as well as delicious and I’m happy to say that the romesco sauce is both. I’m glad you like the recipe, thank you. I’ve made Romesco Sauce, and I’m here to say it’s wonderful! Wow – looks delicious. As a person who follows a low carb diet, I am looking forward to making this sauce. Thanks for sharing. Hi Jovina, If you are following a low carb diet, you are going to love this sauce. It can be used in many ways and is delicious. Thank you for your nice compliment, it is much appreciated. I NEED to make a huge batch too. It’s one of my favourites and love that it’s keto friendly. Hi Angie, Delicious and keto…yes, it is one of my favorites as well. It keeps well in the refrigerator so it is nice to make a big batch. I’ve never had this but it sounds very good. About once per month, I am asked to make a batch of Romesco sauce! It is my husband’s favourite of all sauces. I usually make my sauce without bread as well. Watched Giada make this and thought about trying it. Yours looks great! Thank you Amelia for your nice compliment. Do give the sauce a try, I think you will enjoy it a lot. Hi Fatima, I’m happy that I can share this Catalan sauce with you since you didn’t see it while on holiday on the Costa Brava. If you had been there at end of April, people celebrate a festival called a calçotada, where they eat lots of charred calcots (onions) that are usually dipped in romesco sauce. This looks seriously delish — and beautiful, too! Hi Jeanie, Don’t you love the color of the romesco sauce…it will brighten up any meal you decide to serve it with. Thank you for your compliment. I love this stuff! Terrific with scallops, and has a real affinity for mushrooms, too. Although I often buy nyora chilies from Amazon, red bell peppers seems to work just as well, and are a lot more convenient. I really like this version of the sauce — looks delish, and is very creative. Thanks! I’m with you John, I love it. I prepared it as a dip one evening and one friend almost devoured it by himself. 😀 I know it would be more authentic if I made it with the nyora chilies but using red bell peppers is more convenient when I decide to make romesco at the last minute. Thank you as always for your nice compliment. I usually make it with bread, but love this version. Will give this a try soon! Hi Ronit, After making it with bread and without bread, I think I will be using this version most of the time for the simple reason of it having less carbs and calories. I hope you will enjoy this version and appreciate your nice compliment. Always looking for new low carb dishes and this sauce looks delicious…will be making it soon! Can’t wait….thanks. Hi Donna, Once you try this low carb sauce, I think you will be making it over and over. It is great when used as a dip and delicious when served as a sauce on top of grilled meats, chicken and fish. There aren’t many of your recipes I don’t try and I’m never disappointed. I appreciate your kind words Linda, they are much appreciated. Good luck with all you are doing to get your home ready to sell. That explains it. I’ve only been there in the summer. Sometimes certain kinds of food are seasonal only, like now at Carnival time or at Easter. Must try it, though. That sounds wonderful. I am sure you’ll have a wonderful time. Beautiful sauce. I’ve never tried it but your post reminds me that I really SHOULD one day. Thank you. Hi Boleyn, Romesco sauce is as good as it is pretty and I think you would enjoy it. I hope you give it a try. This sounds so delicious. We are all trying to limit our carbs. So happy to find another recipe loaded with flavor. Hi Madonna, This is one low carb recipe that I know you will really like because it is indeed very flavorful. I do encourage you to give it a try. Quite one of my favourite sauces to prepare but with my medical and nutritionist backgrounds I run away from all the above-mentioned diets at maximum speed and very much use the usual bread . . .:) ! Definitely no low-carbs in this household or in my teachings 🙂 ! But shall try your version for the taste – thanks !! Hi Eha, For various reasons some people are trying to cut back on carbs and for those that are this recipe is a nice one that delivers lots of flavor. For yourself, you can try my previous version made with bread. You will find both versions in the Catalan region of Spain. I don’t think I’ve ever had this wonderful sauce, Karen, but it is so appealing! I can think of so many ways to enjoy it. It has simple ingredients that seem to combine for something unique! Hi Debra, This has to be one of the simplest sauces to make and yet really delivers where the taste is concerned. Thank you for your nice compliment…I hope you give the romesco sauce a try. What a wonderful sauce to jazz up a simple chicken or fish dish! I love your suggestions to use it as a salad dressing or dip, too. Genius!! Hi Liz, there are so many ways of using romesco sauce. It has such a bright flavor that goes well with many different dishes. Thank you for your compliment. Ooooh. My husband has been eating keto for almost two years or so… I’ve lost track. He does all of the cooking so I often eat keto by default and this made my stomach growl. Hi Plumdirt, I have a feeling that both you and your husband will enjoy the romesco sauce. Karen, what a beautiful sauce and thanks for sharing! Low carb is always needed! Hi Pam, I’m glad you like the low carb romesco sauce and it is as good tasting as it is pretty. 🙂 Thank you! What a flavourful fabulous sauce Karen. 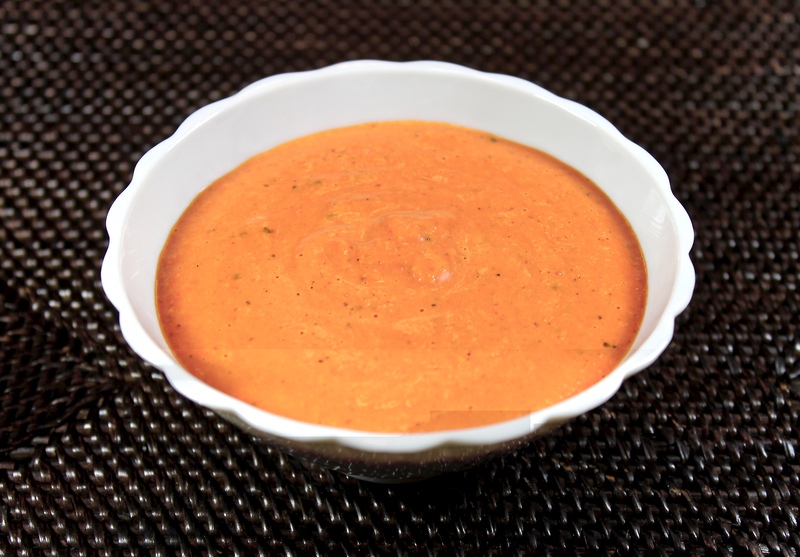 Karen, your Romesco sauce recipe looks to be a great fresh condiment. I love that you made it low-carb, as we’ve been on that life mission as well. We’ll be omitting the almonds (allergies) and substituting sunflower seeds, but I know it’ll still taste wonderful. I can see many dishes that this sauce will be suited for. I like your idea Ron, I’m sure the romesco sauce made with sunflower seeds would be delicious. While we don’t have any allergies, I’m still going to try it that way too for a change. I love a great red pepper sauce Karen and yours, being Keto friendly, is a keeper! Delicious AND good for us is a double treat! Thanks for sharing this recipe! Hi Roz, I’m glad you like my keto friendly version of romesco…thank you for your compliment. I’m always happy to share my recipes. I love all the variations on this sauce and can’t wait to try yours with almonds (mine uses walnuts). I should have said, I really prefer almonds to walnuts – don’t know why I didn’t think to make the change earlier. Hi David, I’ve not tried using walnuts, only almonds when making romesco but I bet that it is good that way too. I was invited to a cooking class at Sur le Table last we and we made romesco sauce! I’d never had it before and it was delicious. We had it with steak and potatoes. I have been making romesco sauce for years and love it. It adds so much flavor to so many dishes. I have to try your recipe. Hi Gerlinde, I’m happy to know that you like romesco sauce as much as we do. I’ll be interested to see what you think of this version made without bread. Such a beautiful and vibrant color! Thank you Atreyee, I think romesco sauce is one of the most colorful sauces you can make. It certainly does brighten up a meal both in color and taste. I love romesco sauce but rarely make it. Your rendition sounds much easier and just as tasty! Hi Debra, This really is a simple sauce to make and I didn’t miss the bread being in it at all. I’m glad you like my version…thanks. Hi Charlie, Yes I think the bread was originally used in the recipe as a thickener as well as a way of using day old bread. Other than being a little thinner, I don’t think that using bread adds very much taste wise and it certainly is much less calorie wise. Using already prepared red peppers makes this recipe so easy to make! Romesco Sauce is fabulous! On eggs, pizza and even as a sandwich spread! Hi Deb, I’ve made romesco by roasting my own peppers when we had our garden but it is a real time saver using the jarred roasted peppers packed in oil. Don’t you just love all the ways you can use the sauce. I love Romesco sauce, and have never made it at home. I’m inspired. I have been to Spain a few times and it’s one of the things I look forward to when I’m there. (Well, that and a million other delicious Spanish foods!) This is a lovely recipe and I will try it! I absolutely love romesco sauce — yours looks so velvety! Thank you Marcie, Yes I do like a velvety sauce…it is just a matter of processing it just a bit longer. I’ve never made this sauce but I am saving your recipe. I love the color and ingredients. I also think it would be great served alongside chicken. Looking for great Keto friendly recipes. I have never been to Spain and my husband wants to plan a trip there. Should I? Hi Emily, Definitely make the sauce and yes…definitely travel to Spain. My husband and I certainly did enjoy visiting there last fall. You’ve opened my eyes to something new, I’ve not had Romesco sauce. It looks and sounds wonderful to spice up any grilled meat or vegetables. Hi Jan, You will really enjoy romesco sauce and it will be a delicious addition to many of the recipes you have shared with us. Your Romesco sauce looks wonderful! I can imagine so many ways to enjoy it! Thank you Marissa, for your nice compliment. Romesco is delicious on so many dishes, I hope you give it a try. Karen, I adore Romesco sauce–could dive right into that plate! I never put bread in it. Sometimes I make it with sunflower seeds instead of almonds. I could eat it by the spoonful, but it really does make a meal of an ordinary chicken breast. I have to leave out the garlic (allergic! ), but no one even misses it. Hi Dana, I’m glad I could share a new recipe with you. I can’t remember if you grow any peppers in your wonderful garden. Red pepper is really a great flavour. One of my favorites 🍎. Hi Eva, Yes red peppers really do add lots of flavor to dishes, I’m glad you like the romesco sauce…thank you. Thank you Thao for your nice compliment. I do hope you enjoy the recipe and since the peppers are roasted, I hope they won’t bother you. We are finally going to Provence and Paris, and I will email you. Thanks for your take on Romesco Sauce, Karen! Bread is a no-no (allergic, not Keto) and I’ve always wanted to try this taste of Italy. Graci! I appreciate your visit and nice compliment Kim. This sounds like the perfect recipe for you to try since there is no bread involved. I hope you will enjoy the sauce as much as my husband and I do. Hi Sheryl, you can take my word for it…the romesco sauce is delicious. I remember making Romescu sauce when I studied cooking last year in Madrid. Yeah, I remember using some stale bread as a thickener- the sauce is good enough to slather on just about anything! You’ve got the color for the sauce just right! Hi Fran, Yes the original version of romesco sauce uses bread but we really enjoyed this lower carb version just as much. Thank you for your nice compliment. I have never made Romescu sauce…thanks for introducing me to it…looks delicious and love the vivid color. Don’t you just love the vibrant color of the romesco sauce Juliana? I do hope you give it a try…it is so good. I hope you have a wonderful week as well, thank you. Such a delicious way to dress up a chicken breast or fish also! Beautiful way to add color to the plate as well. Thank you Susan, you are right the romesco sauce not only adds flavor but color as well. Amazing how the blog world is in synch. I made my sauce in December for our new years eve celebration. Yes, I smiled Tandy when I saw your version of romesco sauce. Not only is this sauce super easy (and super flavorful), but I bet it brought back great memories of your trip to Barcelona! This is a great way to ‘dress up’ grilled chicken! Hi David, You are right, while writing about the romesco sauce I couldn’t help but think of our time spent in Barcelona. Thank you for your nice compliment. Just bookmarked this romesco sauce recipe to try this weekend. Boy, my mouth is watering with anticipation. Great low carb sauce! Hi Sandra, If you have had a chance to make the romesco sauce, I do hope you enjoyed it as much as well didn’t. Eliminating the bread from my original recipe didn’t chance the flavor and did make it a nice low card sauce. I love your version of Romesco Sauce! Barcelona is my favorite European city. Thank you Cathy, I’m happy that you like my low carb version of romesco sauce. Deliciosa salsa luce muy bonito este plato ,además me encantan los porotos,abrazos. I’m happy you like the romesco sauce recipe Amy, I thank you! Yum! Always love a new, healthier option to add to the repertoire! I happen to agree with you Ksenia, this low carb, keto version of my original romesco sauce recipe has all the flavors but is definitely healthier.